In 1900, the United States was primarily an agrarian society, with the majority of the population living in rural areas (Figure 2-2). 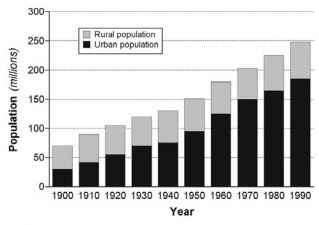 In the 1920s and 1930s, a combination of population growth, the Great Depression, and the rise of urban industries with the increased employment opportunities they afforded caused the rural/urban population balance to shift in favor of cities. The increasing volumes of wastewater generated by this influx of people soon overwhelmed the primary treatment capacity of POTWs, many of which had been underdesigned from the start. Consequently, the modest water quality gains achieved in many cities by primary treatment technology were soon overwhelmed by greater volumes of sewage. Figure 2-2 Population in the United States organized by urban and rural components from 1900 to 1990. Source: U.S. Census Bureau, Population Division (USCB, 2000). immediate concern was the decline of fish and shellfish catches. The Commission concluded that a lack of oxygen in the water was the reason, and two years later, the group initiated what is now one of the longest-running water quality monitoring programs in the world. Sampling proved them right, and in 1911, the Commission set 70 percent oxygen saturation as their criterion for defining polluted waters (Cleary, 1978). The need for adequate dissolved oxygen for aquatic respiration was well known in the late 1800s. Scientists at that time, however, were just learning about the element's critical role in the decomposition of organic matter into simple, stable end products such as carbon dioxide, water, phosphate, and nitrate (Figure 2-3). In natural waters, this process occurs when leaves, bark, dead plants and animals, and other natural carbon-based materials are eaten by bacteria, fungi, and insects. The population of these organisms rises and falls according to the amount of food available. Importantly, because the organisms are aerobic creatures, they require oxygen to breathe and carry on the task of decomposition. 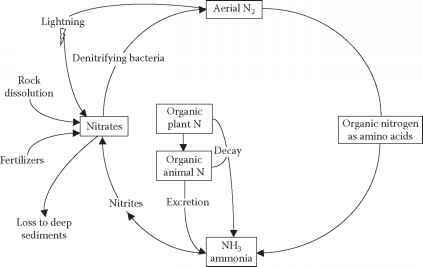 In addition to the carbon cycle of production and decomposition, the nitrogen cycle also influences DO through a series of sequential reactions wherein organic nitrogen compounds are hydrolyzed into ammonia and ammonia is oxidized to nitrite and nitrate (nitrification) by autotrophic nitrifying bacteria, with DO consumed as part of these sequential reactions. Figure 2-3 General forms of reactions involving the breakdown of carbonaceous and nitrogenous organic matter. Source: Dunne and Leopold, 1978.
age or other pollution sources enter the water and the decomposer population (especially bacteria) explodes in response. These organisms have the potential to lower, or even completely exhaust, oxygen in the water. When this occurs, life that depends on the presence of oxygen (aerobic) in the waterbody dies or, where possible, the biota moves on to waters with higher oxygen levels. In the absence of oxygen in water, anaerobic bacteria further break down organic matter. These organisms obtain energy from oxygen bound into other substances such as sulfate compounds. Anaerobic processes are much slower than aerobic decomposition, however, and their end products, such as hydrogen sulfide, are usually noxious.